New for August 2014, Singer House is a classic three bedroom Cotswold Townhouse perfectly juxtaposing the period and contemporary and is decorated with a blend of antiques, contemporary art and classic photography, stylish lamps, wall lights and exquisite soft furnishings. The house has three double bedrooms, one en-suite, and a shared bathroom; a large cosy sitting room with open fire, kitchen breakfast room and a separate dining room with open fire. 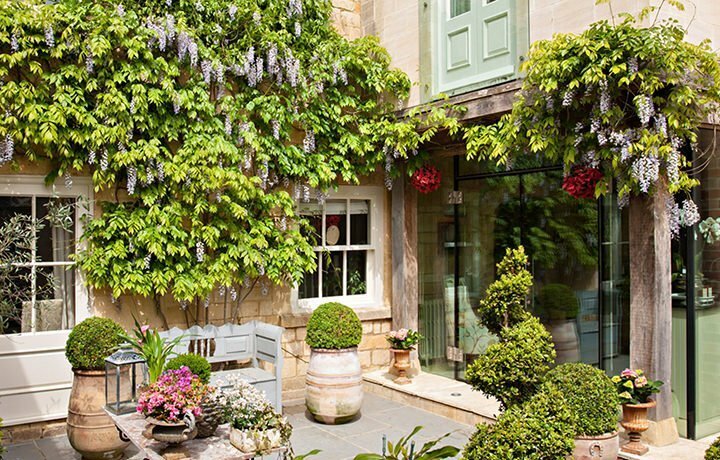 Singer House has a very stylish courtyard garden and is a tranquil haven from the bustle of the traditional Cotswold hight street. Singer House is a classic three bedroom Cotswold Townhouse perfectly juxtaposing the period and contemporary and is decorated with a blend of antiques, contemporary art and classic photography, stylish lamps, wall lights and exquisite soft furnishings. Chipping Campden is a beautiful town in the north Cotswolds, famous for its warm Cotswold stone buildings. Singer House is located on its quintessentially Cotswold Hight Street. Grade II* Listed it is situated at the far end of the High Street near the famous “Wool Church”. A flagstone hallway is accessed off the High Street and off which are the kitchen breakfast room and the elegant and spacious sitting room. Plantation shutters offer both privacy and maximum light and a Farrow & Ball colour pallet give a serene feel; a lovely place to relax or read a classic. The open fire is perfect for winter evenings and furnishings are sumptuous comfortable. Coffee table books, TV with Sky Plus and DVD player with supply of DVDs provide entertainment, as well as an iPod docking station. The kitchen breakfast room is formed by a dining area with banquette seating, perfect for informal meals and breakfast which leads through to the kitchen, with its magnificent frameless glass extension looking onto the stylish courtyard garden and topiary. There is a fridge, range cooker, food processor, blender, dishwasher and microwave. The separate cosy flagstoned dining room has a round table seating six in front of an open fire and its french doors also open out onto the onto the courtyard garden. The three bedrooms are all on the first floor as follows: the first overlooking the garden, with an antique French double bed and built-in wardrobe, the second, also on the rear, has a glass Juliet balcony and can be configured as a twin or a double bed to suit. Sky Plus can also be received in this room. The master bedroom suite – formed from the old ballroom – is indulgent, with its high ceilings, roll top bath, open marble fireplace and Mies van der Rohr seating area. This bedroom is furnished with fine antiques, a king size bed and has a private contemporary en-suite shower room with curved enclosure and limestone floor. All bedrooms have iPod docking stations. There is a family bathroom with rose head shower, steel bathtub with limestone surround and bespoke vanity with Perrin & Rowe taps. There is, naturally, a separate utility room and WC with washer dryer and overflow fridge-freezer. No expense has been spared at Singer House…the perfect retreat in the heart of one of the finest towns in the Cotswolds … something to write home about before you have to tear yourself away.